We’ve gotten a lot of questions and comments posted to our social media accounts about reports of rockets being stored in United Nations Relief and Works Agency for Palestine Refugees in the Near East (UNRWA) schools. This issue was addressed in a briefing to journalists in NYC on Thursday, 31 July, given by UNRWA Commissioner General Pierre Krähenbühl via telephone live from Gaza City, as well as in related press releases (see below). The Commissioner General reported that on three separate occasions, in the course of the regular inspections of its premises, UNRWA discovered rockets hidden in vacant schools in the Gaza Strip. UNRWA immediately communicated the discovery to all parties and to the world as the agency cannot accept that its premises are misused in this way which endangers both staff and civilians. Thanks to the due diligence and investigative approach taken by the UN, these weapons were discovered and UNRWA has launched a comprehensive investigation. 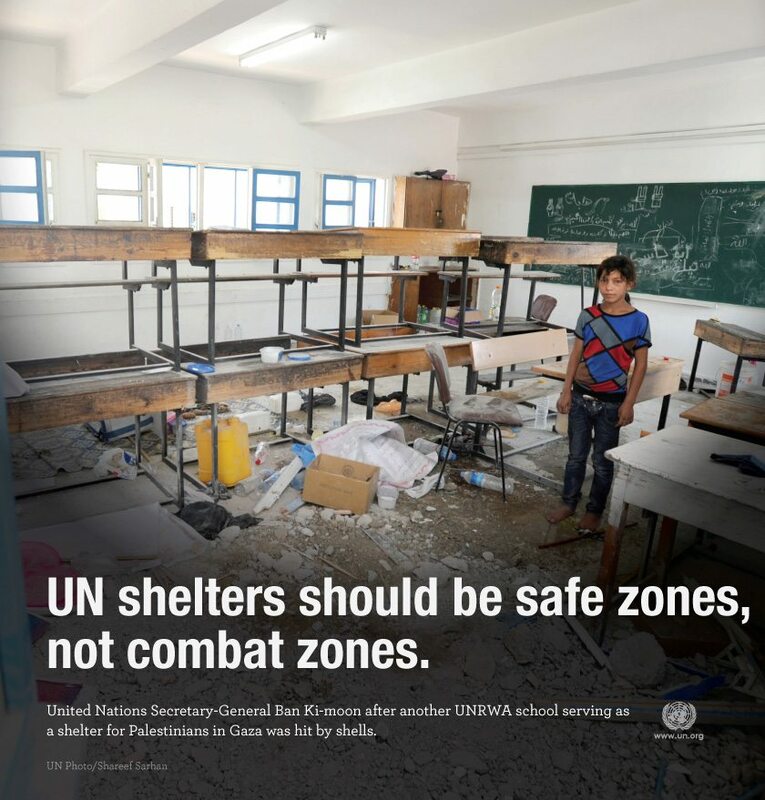 UNRWA has reinforced and continues to implement robust procedures to maintain the neutrality of all its premises, including a strict no-weapons policy and regular inspections of its installations, to ensure they are only used for humanitarian purposes. The UN is taking concerted action to develop systems to increase our ability to prevent any such incidents in the future. Secretary-General Ban Ki-moon has directed the UN Department of Safety and Security and the UN Mine Action Service (UNMAS) to develop immediately and implement an effective security plan for the safe and secure handling of any weapons discovered in UN premises. He has also directed UNMAS to immediately deploy personnel with expertise to deal with this situation. Palestinian civilians in Gaza rely on UNRWA to provide humanitarian assistance and shelter. At all times, and especially during escalations of violence, the sanctity and integrity of UN installations must be respected. All parties have agreed to a 72-hour ceasefire in the conflict in the Gaza Strip, Secretary-General Ban Ki-moon and United States Secretary of State John Kerry announced on Thursday, culminating the latest diplomatic push to end the deadly violence that has gripped the tiny enclave for nearly a month. Looking for UNGA social media content? Get the latest here!